BACKGROUND: Rosacea is a condition more common in women than in men, and in people aged ≥30 years than in younger patients. Adverse events associated with the use of topical medications for rosacea may lead to a lack of treatment adherence. Previous studies have reported low treatment adherence rates among patients with rosacea. OBJECTIVE: To describe the rate of treatment discontinuation resulting from adverse events and the associated healthcare costs among patients with rosacea who are receiving a topical medication. METHODS: We conducted a retrospective cohort study of patients diagnosed with rosacea based on International Classification of Diseases, Ninth Revision, Clinical Modification code 695.3 who were newly initiating topical treatment with metronidazole, azelaic acid, sodium sulfacetamide/sulfur, or benzoyl peroxide between January 1, 2009, and September 30, 2013. 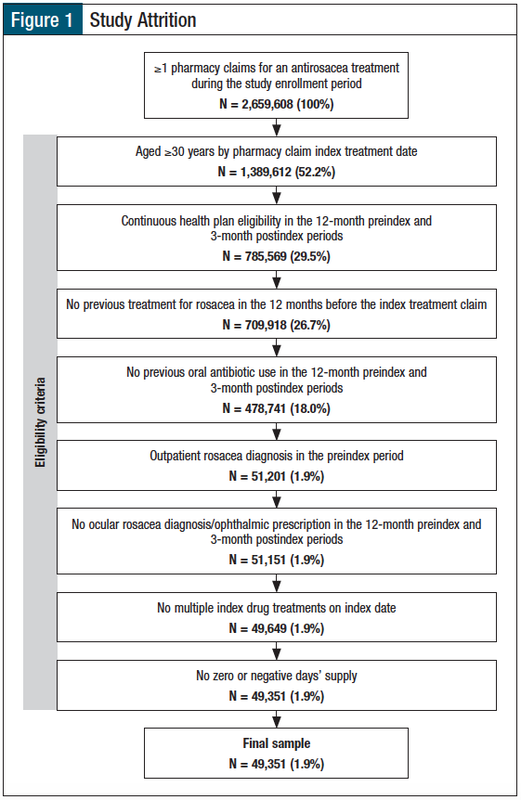 Patients were identified from the MarketScan Commercial Claims and Encounters database and the Medicare Supplemental database and had to be aged ≥30 years, have continuous coverage with medical and pharmacy benefits ≥12 months before treatment and ≥3 months after treatment inititation, and have no evidence of oral antibiotic use or ocular rosacea during the study period. The 3-month period immediately after the index date (ie, first topical rosacea treatment) was defined as the postindex period and was used to evaluate the outcome measures, which included the rate of adverse events, treatment patterns, and healthcare costs. RESULTS: The final cohort included 49,351 patients, with a mean age of 54 years, and 74.5% of the patients were female. Metronidazole was the most common (72.7%) treatment, followed by azelaic acid (21.7%), sodium sulfacetamide/sulfur (3.4%), and benzoyl peroxide (2.2%). A total of 6270 (12.7%) patients had a coded adverse event, of whom 199 (3.2%) continued treatment despite the adverse event, 466 (7.4%) switched to another treatment within 8.8 days, and 5605 (89.4%) discontinued therapy within 31.1 days. 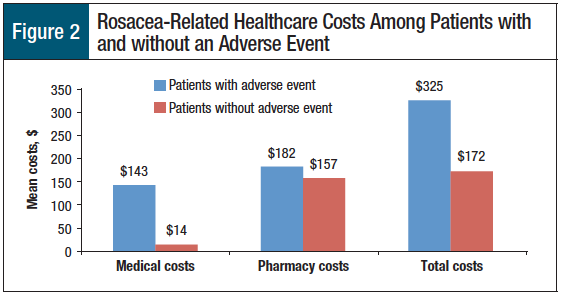 Patients with adverse events incurred, on average, a cost of $325 (medical, $143; pharmacy, $182) in rosacea-related costs; patients without adverse events incurred, on average, a cost of $172 (medical, $14; pharmacy, $157) in rosacea-related costs. CONCLUSIONS: The majority of adverse events associated with current topical drugs for rosacea resulted in treatment switch or discontinuation. Drugs with a different mechanism of action or new formulations of existing drugs may provide additional treatment options for patients and may lead to improved adherence and better symptom control. As a relapsing-remitting chronic inflammatory dermatosis, long-term adherence to pharmacologic treatment is fundamental for disease management. The initial treatment for rosacea typically consists of a topical therapy and/or an oral antibiotic to reduce the frequency and severity of disease flares. 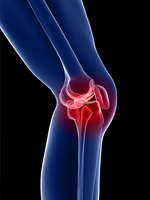 In treatment-naïve patients, monotherapy with a topical agent is generally the first step in treatment. Historically, topical agents used in the treatment of mild-to-moderate papulopustular rosacea have included metronidazole (0.75% gel, 1% gel, and 1% cream), sodium sulfacetamide/sulfur (10% sulfur, 5% cream or lotion), azelaic acid (15% gel or 20% cream), and, to a lesser extent, benzoyl peroxide (2.5%-10%, available in multiple formulations).3 Most recently, 2 new agents have been approved by the US Food and Drug Administration for treating rosacea—ivermectin (1% cream) in 2014 and azelaic acid (15% foam) in 2015. Although the majority of patients experience few major systemic side effects with topical rosacea treatments, other cutaneous reactions (eg, itching, stinging, and irritation) are common; a 2009 national survey of patients with rosacea indicated that side effects may affect patient adherence to specific treatments.2 In this nationwide survey of 2185 patients with rosacea, 427 respondents indicated that they planned to switch medications, and of those, 24% stated that they would do so because of side effects or costs associated with their current treatment.2 More recent evidence suggests that adherence to topical rosacea treatment is low, with an average medication possession ratio (ie, the percentage of time that a patient has access to a medication) of 18.2% for topical agents.3 Although no single agent is appropriate for all patients, new drug formulations may provide additional treatment options for patients with intolerability to current therapies.4 Patient preferences, and ultimately adherence to topical therapy, may vary based on the specific formulation. Currently, it is unclear to what extent adverse events are associated with treatment discontinuation or switch and the overall economic burden of rosacea management. Addressing these knowledge gaps may provide payers, providers, and healthcare systems with a real-world understanding of treatment patterns and associated resource utilization, highlighting the potential need for additional treatment options for patients with rosacea. For this purpose, in this study we evaluated the rate of adverse events among treatment-naïve patients with rosacea who initiated topical treatment, characterized treatment patterns with topical rosacea treatments, and compared healthcare costs associated with topical rosacea treatments among patients with and without adverse events. We conducted a retrospective cohort study using medical and pharmacy claims from MarketScan Commercial Claims and Encounters database and the Medicare Supplemental database from January 1, 2008, to December 31, 2013. The MarketScan Commercial Claims and Encounters database consists of employer-sourced and health plan–sourced medical and drug claims for more than 40 million individuals annually. Enrollees include employees, their spouses, and their dependents who are covered by an employer-sponsored private health insurance. Healthcare for these individuals is provided under a variety of fee-for-service, fully capitated, and partially capitated health plans, including preferred provider organizations (PPOs) and exclusive provider organizations (EPOs), point of service plans, indemnity plans, HMOs, consumer-driven health plans, and high-deductible health plans. Medical claims are linked to outpatient prescription drug claims and person-level enrollment information using blinded patient identifiers. The Medicare Supplemental database contains the inpatient and outpatient medical and prescription claims of Medicare-eligible persons with supplemental insurance plans offered by their former employers. There are approximately 4.3 million enrollees annually included in the database. The Medicare Supplemental database provides detailed cost, use, and health outcomes (eg, adverse events, inpatient death) data for healthcare services performed in the inpatient and outpatient settings. Medical and pharmacy claims include the Medicare-covered portion of payment (represented as the coordination of benefits amount). The medical claims are linked to outpatient prescription drug claims and person-level enrollment data through the use of unique patient or enrollee identifiers. The patient enrollment period spanned from January 1, 2009, through September 30, 2013, and is the period during which patients newly initiating a topical rosacea treatment were selected to be in the study. Eligible patients had at least 1 qualifying prescription pharmacy claim for topical metronidazole, azelaic acid, sodium sulfacetamide/sulfur, or benzoyl peroxide during the enrollment period, with the date of the first topical rosacea treatment serving as the study index date (of note, ivermectin cream and azelaic acid foam were not captured in this analysis, because they were not yet available during the study period). The 12-month period immediately preceding the index date (varies by patient, from January 1, 2008, to September 30, 2013) was defined as the preindex period, and was used to identify patients with a diagnosis of rosacea and the associated patient-level demographic and clinical characteristics, and to confirm that patients had not received previous topical rosacea therapy before the index date. The 3-month period (varies by patient, from January 1, 2009, to December 31, 2013) immediately after the index date defined the postindex period and was used to evaluate the outcome measures. Additional inclusion criteria were being aged ≥30 years on the index date, having ≥1 outpatient claims with a diagnosis of rosacea (International Classification of Diseases, Ninth Revision, Clinical Modification [ICD-9-CM] code 695.3) in the 12-month preindex period, and continuous enrollment in a plan with medical and pharmacy benefits in the 12-month preindex period and 3-month postindex period. Patients with a prescription claim during the 12-month preindex period for an oral antibiotic and/or an oral or topical medication indicated for the treatment of rosacea were excluded from the study. Other exclusion criteria included a prescription claim for an oral antibiotic in the 3-month postindex period, a diagnosis of ocular rosacea (ICD-9-CM code 372.31) or ophthalmic prescription during the 12-month preindex or 3-month postindex period, multiple index drug treatments on the index date, and the days’ supply of a drug that was designated as zero or as a negative number. The choice of a topical drug (based on qualifying prescription claims) constituted the primary exposure of interest. 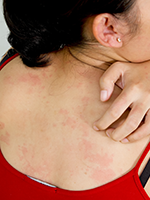 The primary study outcome was the rate of rosacea treatment–related adverse events. An adverse event was defined as a treatment switch within 2 weeks of starting the index rosacea treatment or an inpatient or outpatient medical claim with a diagnosis code for an adverse event of interest. The time to the first adverse event was calculated as the time from the index date to the first adverse event date. Additional outcomes of interest included treatment patterns, specifically treatment persistence, switch, time to switch, and discontinuation, among patients with an adverse event. Persistence was defined as a refill of the index drug or formulation within 1.5 times of the days’ supply of the previous prescription. A switch was defined as a prescription fill for a treatment formulation or treatment type different from the index treatment formulation and type. The time to switch was calculated as the time between the index date and the day before the switch date (ie, the date of fill for the new rosacea treatment). Treatment discontinuation was defined as a gap in treatment that was more than 1.5 times the days’ supply of the previous prescription. The date of discontinuation was the end date of the last observed prescription before the gap. The time to discontinuation was calculated as the time between the index date and the discontinuation date (ie, the end date of the last observed rosacea prescription). The reasons for treatment decisions, such as treatment discontinuation, switch, and continuation, are not captured in administrative claims databases and were not reported in the current study. The overall rosacea-related costs were evaluated for patients with and without an adverse event. The medical costs included payments for claims with rosacea as the primary diagnosis, whereas prescription costs included payments for topical rosacea medications. The costs were captured as medical costs (ie, total inpatient, total outpatient, total emergency department, and total for other outpatient services), prescription costs (ie, total all-prescription fills), and total costs (ie, the sum of medical and prescription costs). Descriptive statistics were used to describe patient demographics, clinical characteristics, and outcome measures. All analyses were reported overall and were stratified by exposure. 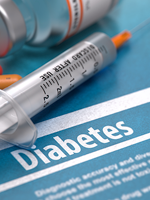 The categorical measures were presented as counts and the percentage of patients in each category, whereas means and standard deviations (SDs) were presented for continuous outcomes. Chi-square or Fisher’s exact tests were used when appropriate to assess differences between categorical variables, and analysis of variance or Kruskal–Wallis tests (depending on normality) were used to check for differences between the continuous variables in the cohorts. Of the approximately 2.7 million patients who filled at least 1 prescription for a rosacea treatment between January 1, 2008, and September 30, 2013, a total of 49,351 met the study inclusion criteria and constituted the treatment-naïve rosacea cohort used for the analysis (Figure 1). The main reasons for exclusion were age <30 years, noncontinuous enrollment in the 12-month preindex and 3-month postindex periods, a prescription for an oral antibiotic, and the lack of a diagnosis for rosacea. The mean age of the population was 54.1 years, and 74.5% were female (Table 1). Approximately 61.9% had an EPO or PPO insurance plan, and 13.1% had an HMO insurance plan. Therapy choice and formulations are summarized in Table 1. Metronidazole was the predominant (72.7%) therapy choice, followed by azelaic acid (21.7%). Gel was the most common (70.4%) formulation, with cream (22.1%) as a distant second. A total of 6270 (12.7%) patients had at least 1 recorded adverse event during the 3-month postindex period, with 5932 (94.6%) patients having a diagnosis code for an adverse event and 386 (6.2%) patients undergoing treatment switch within 2 weeks. The rate of adverse events differed by the therapy choice (P <.0001), with benzoyl peroxide (22.5%) and sodium sulfacetamide/sulfur (14.3%) having higher rates than metronidazole (12.3%) and azelaic acid (12.9%) as seen in Table 2. The treatment discontinuation rate was high (89.4%) among patients with an adverse event, and the average time to discontinuation was 31 days (SD, 17). Approximately 7.4% of patients with an adverse event switched to a different treatment, and the average time to treatment switch was 9 days (SD, 12). Only 3.2% of patients persisted with a treatment during the entire postindex period, and the average time of persistence was 38 days (SD, 27.3). The 3-month rosacea-related healthcare costs were significantly greater among patients with an adverse event than in patients without an adverse event ($325 vs $172, respectively; P <.001; Figure 2). The medical costs were 10 times greater for patients with an adverse event than in patients without an adverse event ($143 vs $14, respectively; P <.001), whereas pharmacy costs between patients with and without an adverse event differed by only $25 ($182 vs $157, respectively; P <.001). Medical, pharmacy, and total costs by therapy type are shown in Table 3. Among patients with an adverse event, therapy choices with higher adverse event rates also incurred higher medical costs. The rosacea-related medical costs were higher for benzoyl peroxide ($242) and sodium sulfacetamide/sulfur ($178) than for azelaic acid ($134) and metronidazole ($138). The pharmacy costs also differed by therapy type, with sodium sulfacetamide/sulfur having the lowest cost ($151) and benzoyl peroxide having the highest cost ($212). To our knowledge, these results are the first to describe adverse events, treatment patterns, and healthcare costs for patients receiving topical therapy for rosacea in the United States. Our findings reveal the differences in adverse event rates across topical agents and the increased discontinuation rates and costs attributable to adverse events, which may aid dermatologists and other providers in rosacea therapy decision-making. Among treatment-naïve patients with rosacea who initiated topical treatment, the rate of adverse events was estimated to be 12.7% during a 3-month period. The highest adverse event rates were observed with sodium sulfaceta­mide/sulfur and benzoyl peroxide; azelaic acid and metronidazole had lower adverse event rates. Drugs leading to higher adverse event rates were also associated with higher medical costs. Patients who had an adverse event incurred significantly higher rosacea-related costs compared with those who did not have an adverse event, particularly with respect to medical costs. The rate of treatment discontinuation was high among patients with an adverse event. Evidence suggests that in the treatment of rosacea, antibiotics primarily work by anti-inflammatory mechanisms, not antimicrobial effects (supported by activity in rosacea at subantimicrobial doses10). Nonetheless, the use of antibiotics is still generally considered undesirable among dermatologists (who are the primary providers of care for the rosacea patient population11) in light of changing patterns of antibiotic resistance.12,13 Our analysis supports that there is an opportunity to further minimize the costs of rosacea by attenuating adverse event rates and their corresponding 10-time increase in medical costs and near doubling of total healthcare costs. A strength of our analysis was our inclusive approach that captured all topical agents available for the treatment of rosacea at the time of the analysis, including benzoyl peroxide, even though it is not frequently used in the United States. Our study does not provide insight into agents approved after 2013, namely, ivermectin and azelaic acid foam, for which utilization patterns may differ from those of the older agents (eg, drug characteristics differ between the newer hydrophilic and older foam formulations). The results presented here must be viewed in light of some additional limitations. Retrospective database studies involve data that are collected for purposes other than research, and the analysis is constrained by the codes, which may include coding errors and undercoding contained in records. At the same time, however, this bias would be expected across all the evaluated drugs, without confounding the results. We found that nearly all patients with an adverse event discontinued treatment at the end of the study period, but the exact reasons for treatment discontinuation remain unknown. In addition, patients may have received concomitant treatment with over-the-counter topical agents that are not captured in this database, which may have contributed to at least some of the adverse events identified in the study. Conversely, it is possible that appropriate use of over-the-counter agents, such as moisturizers and sunscreens, might have contributed to a reduction in flares and certain adverse events, thereby increasing adherence among select patients. Finally, our study is descriptive in nature and does not account for differences between the patients that may affect the study outcomes, with the unadjusted analyses not accounting for all known and unknown patient-, provider-, and geographic-level factors with the potential for creating bias in the resulting estimates. The majority of adverse events associated with current rosacea drugs or formulations result in high treatment switch and discontinuation, affecting the quality and cost of care. 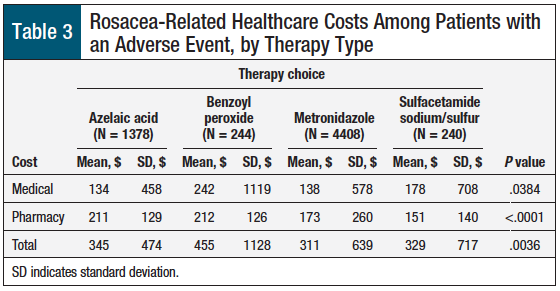 Azelaic acid and metronidazole produced the lowest adverse event rates, whereas sodium sulfacetamide/sulfur and benzoyl peroxide produced the highest adverse event rates, which translated into higher rosacea-related costs (predominantly medical costs). New drugs or formulations are needed to provide additional treatment options for patients and may lead to improved persistence and better symptom control. This study was funded by Bayer HealthCare Pharmaceuticals. Mr Williamson is an employee of Bayer Pharma. Mr Kamalakar is an employee of AbbVie. Ms Ogbonnaya is a consultant to Bayer. Dr Zagadailov is an employee of and owns stock in Takeda Pharmaceuticals, and owns stock in AmerisourceBergen. Dr Eaddy is a consultant to Bayer. Mr Kreilick is an employee of Bayer. 1. National Rosacea Society. Where is rosacea worst? New map shows geographic prevalence. Press release. September 4, 2013. www.rosacea.org/press/where-rosacea-worst-new-map-shows-geographic-prevalence. Accessed June 21, 2016. 2. Elewski BE. Results of a national rosacea patient survey: common issues that concern rosacea sufferers. J Drugs Dermatol. 2009;8:120-123. 3. Helwick C. Cost and drug utilization patterns associated with the management of rosacea. Am Health Drug Benefits. 2013;6(9):583-584. 4. Tamarkin D, Friedman D, Shemer A. Emollient foam in topical drug delivery. Expert Opin Drug Deliv. 2006;3:799-807. 5. Tyring S, Solomon JA, Staedtler G, et al. Patient-reported outcomes of azelaic acid foam 15% for patients with papulopustular rosacea: secondary efficacy results from a randomized, controlled, double-blind, phase 3 trial. Cutis. 2016;98:269-275. 6. Solomon JA, Tyring S, Staedtler G, et al. Investigator-reported efficacy of azelaic acid foam 15% in patients with papulopustular rosacea: secondary efficacy outcomes from a randomized, controlled, double-blind, phase 3 trial. Cutis. 2016;98:187-194. 7. Sugarman JH, Fleischer AB Jr, Feldman SR. Off-label prescribing in the treatment of dermatologic disease. J Am Acad Dermatol. 2002;47:217-223. 8. Culp B, Scheinfeld N. Rosacea: a review. P T. 2009;34:38-45. 9. Goldgar C, Keahey DJ, Houchins J. Treatment options for acne rosacea. Am Fam Physician. 2009;80:461-468. 10. Korting HC, Schöllmann C. Current topical and systemic approaches to treatment of rosacea. J Eur Acad Dermatol Venereol. 2009;23:876-882. 11. Davis SA, Feldman SR. Patterns of ambulatory care usage and leading treatments for rosacea. J Dermatolog Treat. 2014;25:275-277. 12. Del Rosso JQ, Leyden JJ, Thiboutot D, Webster GF. Antibiotic use in acne vulgaris and rosacea: clinical considerations and resistance issues of significance to dermatologists. Cutis. 2008;82(2 suppl 2):5-12. 13. Yentzer BA, Fleischer AB Jr. Changes in rosacea comorbidities and treatment utilization over time. J Drugs Dermatol. 2010;9:1402-1406. Rosacea, a relapsing-remitting chronic inflammatory dermatosis, is one of the most common skin conditions in the United States.1 The initial treatment of rosacea usually involves monotherapy with topical agents, such as metronidazole, sodium sulfacetamide/sulfur, azelaic acid, ivermectin, or benzoyl peroxide. PATIENTS/PROVIDERS: The challenge that clinicians as well as patients face in the management of rosacea is that the topical agents themselves also cause adverse events, such as stinging, itching, and irritation. These events are very troublesome for some patients, who may not be adhering to therapy because of these side effects: adherence to therapy is important for the treatment of rosacea, which is a chronic skin condition that requires patient adherence to therapy. We have learned from published recommendations that steps taken to improve adherence may be applicable across most drug therapies and disease states.5 We must heed these recommendations and apply them to their fullest to help our patients. Rosacea must be taken seriously, and the same types of strategies used to improve adherence to therapies in the treatment of life-threatening conditions may also apply to address this chronic condition with success. I agree with Williamson and colleagues that new therapies with a decreased adverse event profile will help to manage rosacea4; however, the existing therapies are effective when patients are adherent to treatment. We can work closely with patients to address these adverse events and keep patients using their therapy. In the end, this will also keep the costs in control, address any patient experience with adverse events, and effectively treat rosacea. 1. National Rosacea Society. Where is rosacea worst? New map shows geographic prevalence. Press release. September 4, 2013. www.rosacea.org/press/whererosacea-worst-new-map-shows-geographic-prevalence. Accessed May 12, 2017. 2. Helwick C. Cost and drug utilization patterns associated with the management of rosacea. Am Health Drug Benefits. 2013;6(9):583-584. 3. Roebuck MR, Liberman JN, Gemmill-Toyama M, Brennan TA. Medication adherence leads to lower health care use and costs despite increased drug spending. Health Aff (Millwood). 2011;1:91-99. 4. Williamson T, Kamalakar R, Ogbonnaya A, et al. Rate of adverse events and healthcare costs associated with the topical treatment of rosacea. Am Health Drug Benefits. 2017;10(3):113-119. 5. Atreja A, Bellam N, Levy RS. 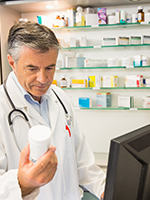 Strategies to enhance patient adherence: making it simple. MedGenMed. 2005;7:4. Epub 2005 Mar 15.